I’m definitely overdosing on fall colors today, but I don’t mind. I like earth tones and I love orange. When I first got dressed, I had on a black t-shirt and orange pants. A bit too halloweenish! So I added caramel boots and a light blazer. My pants are by Dickies. When I first discovered Dickies, I thought I was onto something new–until my dad pointed out his work pants. He’s a painter and interior decorator and wears Dickies to work every day (his are white and splattered in paint). I quickly learned that the company, so well-known for work wear, made the leap to fashion. Levi’s, Carhartt and Doctor Marten’s are also in this category: work wear as fashion. And since I wore this outfit to work (in an office, but still), I think it’s appropriate. 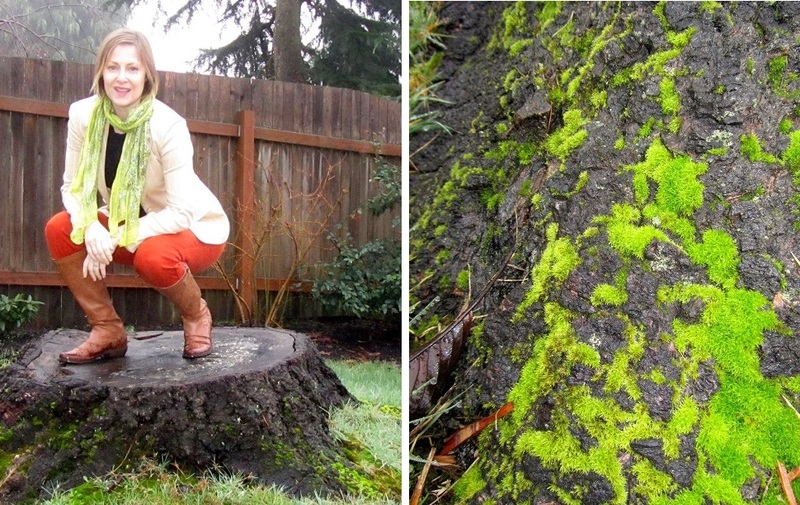 I’m loving the fall colors and how the rain in Seattle brings out the moss. I’ve joined Visible Monday and Monday Bloom–check out what all the others are wearing! I also joined Thrifter’s Anonymous, where I’m the Thrifter of the Week! Thanks Shana! 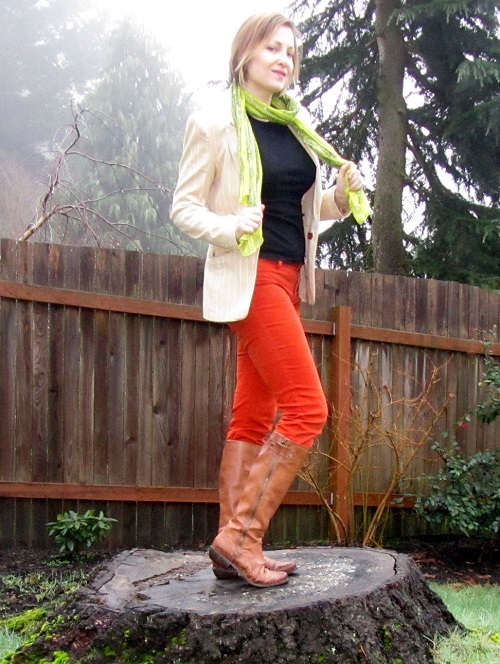 Lovely bright outfit for fall! It is bright, isn’t it? I don’t mind. It’s pretty gray around here this time of year. Thanks for stopping by! Thanks Patti! The scarf is so lightweight I can wear it all year long! Thanks for stopping by! I like my orange jeans and wear them often, but I think they look different each time. Pretty neutral for a bright color! Nah … no OD … perfect for fall in Seattle! Those warm colors work so well in the Land of Green! You look beautiful. Enjoy your season. Thank you! The orange does compliment all the green moss 😛 As much as I’m sad to see summer go, fall is so fresh and clean. The air smells great! Fun ensemble in fall tones and colors. Great PNW scenery I readily recognize. 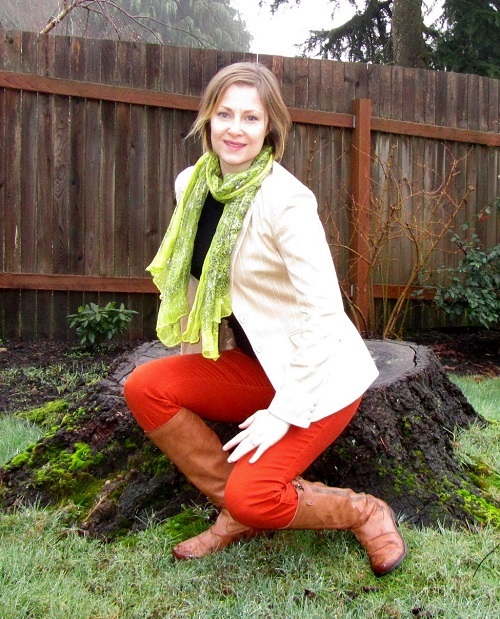 I love your cheerful fall outfit and I’m lovin’ orange (as you know)!